So it’s been a rather hectic 4 days – a variety of sights, sounds, monuments, hotels, beaches, backwaters, museums and anything else you can think of – have been clicked, blogged about, tweeted by 26 bloggers, writers and photographers who have converged in Kerala from all over the world. We started our journey in Trivandrum on March 10, spent the next day in Kovalam beach and then travelled to Kollam via Varkala on March 12. On March 13, we were in Kovalam. Four days on the road, and I’m trying to get used to the “fast” pace of the trip in the meanwhile. It’s been an experience that is a first for me. I don’t think I’ve travelled in such a big group. Usually, it’s solo (evolving as my favourite mode!) or with a smaller group (which when like-minded, makes for pleasurable travel). For example, in a large group, it takes time to know everyone. With so many people, from different nations and continents, it’s a bit hard to keep track. Anyway, we got introduced to our bus and our driver Ron, who will be driving us around Kerala for the next 15 days. And the team of Rutavi, Kenny, Sooraj and Manoj who will be with us as we traverse God’s own country. I’ve had a chance to interact with some of the fellow travellers and still getting to know some of them. But Vijay Nambiar’s put out a list of who’s on the bus in case you’re curious! Got some time to chat with Daniel, who is from Brasil, a very experienced travel writer. Over breakfast in Kovalam, he gave me some interesting insights into life as a writer, both freelancing and working for other people. Daniel is on his own now, but he says it largely depends on many external factors as to which side he works for! I’m hoping to chat more with the rest of them, over the next few days. A photo snapshot of the many experiences on Day 1 of the trip. My first view of the backwaters as I land in Trivandrum (Thiruvanthapuram). We have lunch at the Poovar Island Resort – I am deposited right at the boat jetty, after which there’s a short ride and I join the rest of the travellers who have already reached. This resort has some really great “floating” cottages on the waterfront. A perfect way to enjoy the backwaters, the sea and just relax for a few days. After lunch at Poovar, we head to another part of the area called Chowara and to the Somatheeram Ayurveda resort (the first in the world it claims). The location of the resort is rather gorgeous, with a view of the beach and a vast expanse of green coconut trees to one side. I definitely wouldn’t mind spending a week here, relaxing and getting rejuvenated. The same property also has a place called Manatheeram, and we enjoy the views there with high tea. The sea views, greenery all around, a hammock and time to while away – the perfect spot to be in! This is part of the Somatheeram property. The property has ayurvedic treatments for many different ailments, besides a wellness package. Mr Chandrashekharan Nair also told us a bit more about the principles of Ayurveda. Also, was surprised to know that this form did not originate in Kerala, though now practiced widely in this part of the country. Location is everything they say and we got a glimpse of one of the most beautiful properties around – The Leela, Kovalam. I remember, many years ago coming on a family trip, looking at this property from the beach (it was then an ITDC property). It was a nice feeling, so many years later, to experience the view from the other side! The sunset was magical and I think everyone was quite sad to leave this property – one of the best so far. 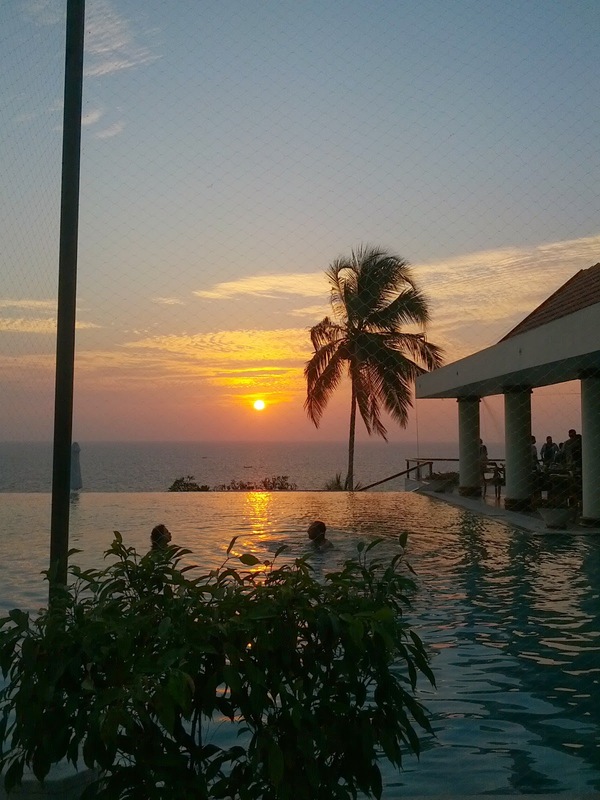 Enjoying the sunset views from the Leela, Kovalam. A hectic start to the day I must say, as we retired at The Estuary Island Resort. It was too dark to really enjoy the hotel, but we were just happy to end the day on a good note. Great start to the journey! Have fun. Next PostAnd here’s presenting the world richest temple!